Basic asset management is fine for basic investment needs. But when your clients have more sophisticated demands, you need advanced investment and wealth management solutions. Taxes can significantly reduce investable income and real returns. We offer custom, tax-managed solutions that aim for superior after-tax returns. "Today’s high-net-worth investors want predictable pre-tax returns, meaningful after-tax opportunities, and solutions as unique as they are. Our expertise helps clients navigate these complexities." Rising interest rates are a major threat to portfolios. Our unique income solutions help you navigate interest rate cycles. "The easy money made in bonds is behind us. It’s going to take a lot more than traditional bond funds to maximize returns while managing risk. That’s where Eaton Vance comes in." Evolving needs require highly personalized portfolios. 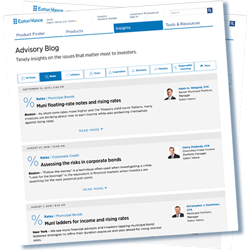 Our separately managed strategies span the risk continuum, from low cost, rules-based portfolios to actively managed global portfolios and option overlay strategies. "Whether it’s our customized investor focus, refined investment process or ability to provide direct portfolio manager access, investors choose Eaton Vance when they need a manager to deliver." Investing responsibly matters to more people every day. We offer one of the largest and most diversified families of responsibly invested funds in the industry. "We know more investors want to invest with purpose and meaning, to achieve something important in addition to financial return. Calvert has the research, record and strength to help them succeed." Global investing has far-reaching advantages. Our array of specialized global, local and emerging market strategies provide greater portfolio diversification. "It’s in our DNA to serve the high expectations of global equity investors around the world. Our top-down investment process and contrarian view are eminently different than most other managers." Equity markets can be volatile. Our skilled, experienced research teams identify and capitalize on market inefficiencies to help manage risk and deliver consistent long-term performance. "Our active process focuses on uncovering quality investments with long-term potential over full market cycles. We believe you can't deliver consistent quality without a committed and uncompromised approach practiced every day." The old playbook for municipal bonds doesn’t work anymore. That’s why our deep, seasoned municipal bond team provides extensive access to opportunities, in-depth credit research and institutional execution. "When it comes to muni bond investing, one size does not fit all. 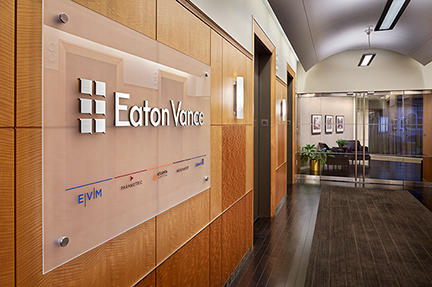 At Eaton Vance, we have the experience, depth and breadth of offerings to address the many challenges investors face today." Today’s affluent clients demand a high level of personalized service. Our specialized solutions are designed to minimize taxes, manage volatility and enhance total return. "It takes thoughtful dialogue and specific tools to effectively solve the myriad forms of concentrated wealth." At Eaton Vance, you can choose active, passive, rules-based and responsible investing strategies that go beyond traditional, mainstream models. Whether your clients seek to grow wealth, generate income, manage volatility and/or reduce taxes, the specialized strategies we offer through our five independent affiliates can help you fine-tune their approach. Our approach is grounded in independent insight and a unique perspective that anticipates investors’ needs rather than merely following industry trends. It’s a progressive mindset that has served our clients well for more than 90 years. Investing entails risks and there can be no assurance that Eaton Vance (and its affiliates) will achieve profits or avoid incurring losses. Prospective investors should consult with a tax or legal advisor before making any investment decision.